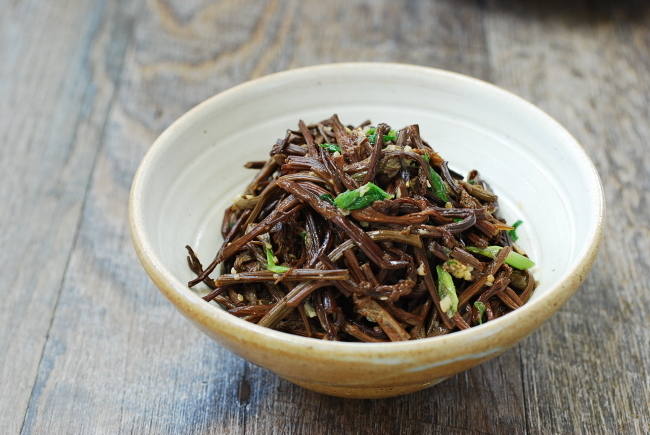 Gosari namul is a popular side dish made with fiddlehead ferns (also known as bracken or fernbrake). It traditionally is one of the vegetable side dishes served in three colors -- collectively called samsaek, or three-color, namul. Gosari grows in the hills and mountains. It has a deep, earthy flavor with a chewy texture, which makes it an essential addition to dishes such as bibimbap and yukgaejang (a spicy beef and vegetable soup). This recipe uses dried gosari. Look for the ones with short, thin stems. You can also find boiled or presoaked gosari in markets in Korea. Rehydrating gosari takes a combination of soaking and boiling. I find it quicker to boil first and then soak until it reaches the desired tenderness. The time can vary depending on the gosari. Add the gosari and four to five cups of water to a medium pot. Boil over medium heat, covered, until tender, 30 to 40 minutes. The time can vary depending on the gosari. Turn the heat off and let it cool in the cooking water. When ready to use, rinse in cold water and drain. Cut into 7- to 8-centimeter lengths, removing tough ends of the stems, if any. Mix the gosari with the soy sauce, sugar, and garlic. Let stand for 10 minutes. Saute in a skillet with 1 tablespoon of vegetable/canola oil for about four to five minutes over medium heat. Pour in 1/4 cup of water (or dashima or beef broth). Cook for a few more minutes, stirring occasionally, until the liquid is almost gone. Add the scallion, sesame oil, and sesame seeds. Stir well before turning the heat off.